Improve your MIG and TIG welding skills for steel. In this hands-on class, you will learn and practice weld joints, work preparation, and fabrication through the creation of a steel bookend project which incorporates multiple joint types and material shapes. This class is 3 evenings of 3 hours each, with days in between sessions to allow the students to practice on their own. You are also encouraged to practice welding on your own (at Maker Works with an active membership, or elsewhere) in preparation for this class. Long hair must be pulled back from the face. A welding hat, bandana, or hood will help protect your hair from sparks. Bring your reading glasses, if you use them. Bring earplugs. Other ear protection doesn’t fit under welding hoods, so plugs are the only option. We recommend 3M reusable ear plugs (found at Meijer or online). 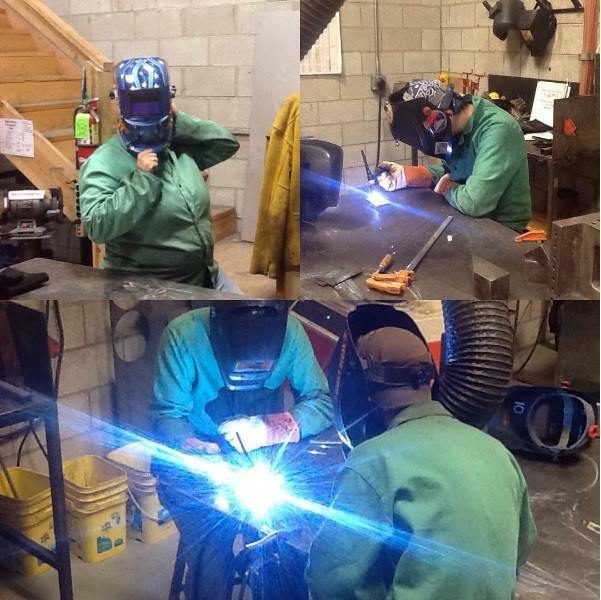 Lauka has been welding and fabricating professionally since 2012 and earned an associates degree from Washtenaw Community College’s welding and fabrication department. At a variety of work sites and shops, she has gained experience with production fabrication, custom build projects, and artistic sculpture. Most of her free time is spent at a private shop creating art.